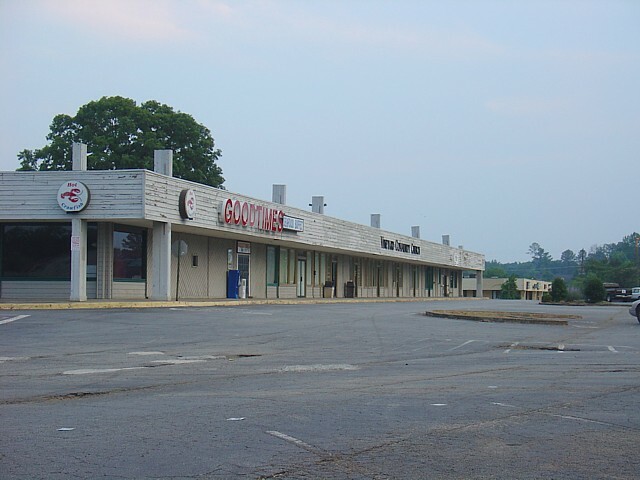 One of the more interesting dead shopping centers I've uncovered is a complicated strip mall located in eastern Cobb County near the intersection of two major county highways. Named Sprayberry Crossing, the thing that makes it significant is how completely retro the whole center is as well as how the design is much like an early version of today's "lifestyle centers". Why I'd pick such a random strip mall is by and large the very outlandish 70's design of the whole place and the fact it was never updated. The entire center is designed with cedar trim in that usual 45 degree-angled cut they did during that time. At the time, this design very nicely matched all the cedar homes being built in the area around it. Not only that, but such design made for an extremely outlandish Ogletree's/Bruno's that looks like nothing you'd see today. 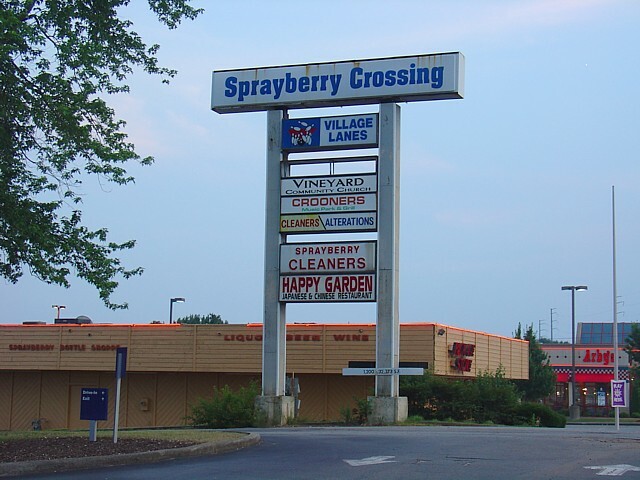 Sprayberry Crossing was originally anchored by an Ogletree's grocery store and a bowling alley, which is still operational. Ogletree's was a local grocery chain with about eight locations prior to being purchased by Bruno's. The Bruno's there closed when the chain scaled back operations and closed all Georgia locations. The center is at the northeast corner of Sandy Plains and East Piedmont Roads and is accessable from Sandy Plains Road. When Bruno's closed, the rest of the strip went to hell with it and left a very blighted area around it. The bowling alley, however, holds its own hidden back behind the retail graveyard you have to drive through to get to it. That bowling alley is one of the few in the area. That is one funky looking supermarket. Looks like a Safeway crossed with a '80s Burger King. I grew up at the corner of Post Oak Tritt and Holly Springs, about 3/4 of a mile from this center. We always joked that they filmed the moon landings in the parking lot, as they are always filled with craters. Ahh, good old Ogletree's. I miss it. It wasn't the same when Bruno's took over, but I still liked Bruno's better than Kroger or Publix. The poor center is such an eyesore now. I'm a little surprised someone hasn't come up and purchased the whole plot and rebuilt or put something completely different there. JT, I absolutely LOVE the site! I was worried when your other Rich's site disappeared, but I'm glad to see that you're back and better than ever! Well I grew up not too far from there...that's how I knew about it. I always thought it was outlandish and it struck me as cool, so it was kinda sad to see it dead and forgotten. I don't remember the Ogletree's, but I remember the Bruno's (Finer Foods) there. I never shopped there, though. Was the parking lot that bad when it was still doing well? When did Bruno's buy out Ogletree's? Cobb County has the "inner ring suburb" problem and has quite a few dead shopping centers. I really wonder how high it is on the list of priorities when they're trying to do something about Old Highway 5 and other blighted areas like Smyrna (note the big dead Rich's at Cobb Center). Glad you like my site :) Yeah, this will make up for the Rich's site, though I'm using lower resolution photos this time for various reasons. 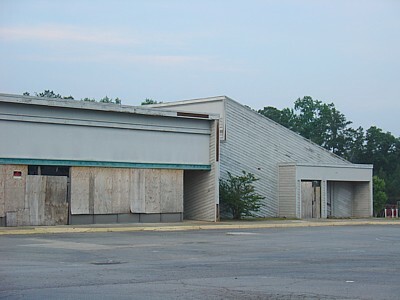 The original plan was to restore the Rich's site as part of an actual "Georgia Retail Memories" website, but I knew that with my busy schedule that the likelihood of that for years was slim. Wow, JT, I've probably passed by you thousands of times and never knew it was you! I went to a college of 2,000 students, and it amazed me how many people I met who had grown up within 5 miles of where I did in Atlanta, and I had never seen them before in my life. Anyways...I would guess Ogletree's was bought by Bruno's in 1988 or so...very rough guess. I can remember right after the purchase the store had put up handwritten signs at each register saying something to the effect of: "Please make your checks payable to Bruno's from now on." The interior of the store was just as outlandish as the exterior. Red carpet...red walls, except I think the produce department was green. Lots of gold-patterned wallpaper in the sides of the vaulted ceilings. Frozen foods were in the middle, produce in the back right corner, meat along the rear, dairy on the back left wall, bakery in the front left...if you gave me enough space, I might even be able to list it aisle-by-aisle! I do, though, remember that it was carpeted, or at least the areas not in produce, and not along the back wall where the meat department was. The parking lot was...okay...when it was still in operation. There must have been some drainage issues in the east end of the center, because no matter how much asphalt they threw in to patch this one huge (read: Buick-sized) hole, it would come back in 2 months. (Right where you'd turn in to go to Arby's). Once Bruno's closed, it really went downhill. I'd have to say that the last brand-name tenant was Revco, which was closed right after CVS (boo) bought the chain. If you look at the first picture, and imagine that as a side of a square, Revco would have been at your right. Also next to Revco I remember there being a hardware/lumber type store...Lummus, I think? I still can't believe that the Fortune Chinese restaurant closed! (Now the Good Times restaurant in the picture.) They and the Sprayberry cleaners were probably the last two original tenants -- and that's saying quite a bit. Our next-door neighbor actually worked at the butcher counter there for a while. It is very sad and forgotten. I like that "inner-ring suburb" label -- it makes me laugh every time I hear someone refer to it as "close-in Cobb County." That particular area is inbetween $750k homes and neighborhoods with an influx of immigrants (not bashing them in any way). For whatever reason, the strip across the street -- Sprayberry Corners -- has survived, replacing the Food Giant with (eventually) Big Lots and the Eckerd with (eventually) NAPA. It's probably about frontage, as you can't see the bulk of Sprayberry Crossing from Sandy Plains Road. I must admit that I've had a dream or two where they went in and reopened the store, complete with 1970s decor. Reality is such a gyp! You didn't go to Sprayberry, did you? Class of 97! Nope, I grew up in Cherokee County, class of 98. I knew people in Cobb County, though...I lived less than a mile from the county line and left in 2000. I've run into retail nuts and road enthusiasts both in the area as well as other people a hell of a lot like me, so apparently those of us are kinda grouped together in these funky areas. I grew up in a totally 70's retro house, so I guess that's how I got so into this in part. You know, I lived in this area in the late 70s ('77 to '79). I remember this Ogletrees and going there with my mother. I can also remember that my father (ever the cost-conscious middle manager he was) would complain about the prices. I also remember that there was a Richway nearby with the most incredible Matchbox car collection. Does anyone remember where the Richway locations were? Does anyone remember the Kroger that's now a K&G Menswear store (I think it's on Lower Roswell Road). Or here's a trip down memory lane.... Every time I went to Richway with my folks, we'd stop at Danver's for a killer roast beef sandwich. Anyone remember that place? Danver's is new to me. Where was it at and what is it now? I'm pretty well acquainted with the Richway locations. The two in Cobb County were at Sandy Plains and Canton Road Connector (S.R. 5 Spur) and on Cobb Pkwy (U.S. 41) at Windy Hill Road. There was also one at Roswell Mall that closed when the Super Target opened further west on Woodstock Road (S.R. 92). A poster here said there were 31 total locations in Georgia, Tennessee, South Carolina, North Carolina and Florida. Oh the Kroger that is now the K&G is on Canton Road near Piedmont Road. The Kmart there is now an Old Time Pottery and the Kroger was subdivided (only part is K&G). It closed there in 1992 and relocated further up the road the same time Kmart moved over to Highland Crossing (now a Home Depot). I actually worked at the Sprayberry Crossing Bruno's when I was in college from 1991-1993. Not too long after that, this location was closed, and the employees could go work at the Bruno's that was at the corner of Johnson Ferry and Upper Roswell. That location was originally an A&P if I remember correctly. Then when Bruno's left GA it became some other grocery store...and that location has now been leveled. They are building something new there. This is a very interesting site! I worked at the Sprayberry Crossing Bruno's also bagging groceries when I was in high 88-91. Remember all the kids that would cruse the parking lot on Friday and Saturday nights. Danvers...had great burgers and roast beef sandwiches. There were 2 on 41, one down by Cumberland and another by the Big Chicken, it was built on the site of the old Shoney's drive-in and was a Taco Bell last time I was by there. A friend of mine worked there and it was a division of Shoneys. I heard that Lowes is planning a location where Sprayberry Crossing is. I grew up just down the street off of Sandy Plains and Davis. I to have lots of memories of Sprayberry Crossing. I used to practically live at Bumpers Junction arcade back in the early 80's and Ogletrees is where my mom always drug me once a week to go grocery shopping. Good site JT! I recently moved to the area, near Trickum and Sandy Plains. I wondered what the history of that place was, and what was with the funky architecture! To shed some light on why the property has resisted redevelopment, very possibly may have to do with environmental issues. The old dry cleaners there has both RCRA and CERCLA (Superfund) actions against it. That complicates matters severely for a new developer. FYI, the Kroger's across Peidmont from Sprayberry Crossing closed last fall. The shopping center it was in looks like it is going down the same path as Sprayberry Crossing. I drive through that shopping center on almost a daily basis. The styling isn't so much what gets me on the place as it is the condition of the shopping center. The place is poorly maintained with paint flaking off everywhere craters and potholes left and right in the parking lot (be real careful driving through; especially around the hole near the entrance to Arby's) and the amount of space between everything that just makes the place look more vacant. The center is on the corner of two very busy roads in the middle of a very affluent neighborhood and within walking distance of a high school. With a major renovation or redevelopment, there is no reason this place shouldn't be doing well. Wasn't aware of the dry cleaner superfund issue... I think the primary reason for a developer not coming in and cleaning it out is because there is a small cemetary (100 or so plots) behind the main strip. It is hidden between the existing building that houses a few storefront churches and the self-storage place next door. The county is in the final planning/right-of-way acquisition to rework the sandy plains/piedmont intersection. Maybe that will help get more interest in cleaning up Sprayberry Crossing. I pass through the parking lot daily, as a cut-thru from Post Oak Tritt to Piedmont (heading south). I find it's easier than all the lights, although perilous due to pot holes. I am conflicted about redevelopment of the site due to traffic concerns. As much as I would love a Target or Loews nearby, the add'l traffic would be a nightmare. I think Cobb County should be very careful when land-planning and re-zoning the site. In terms of the environmental issue, I don't think the dry cleaning mess would be that expensive to remedy (compared to fuel spill and USTs). A developer could even apply for brownfield redevelopment funds and potentially new markets tax credits to help develop the property. Does anyone know what will happen to former Sprayberry Kroger? It no longer says "For Lease" but did not see any activity. and you can see the redevelopment plans for the center if you scroll down to the bottom..
What about behind the strip mall, that old chain linked fenced in graveyard. My mother used to drove up and say, "I wonder what Mr Picklesimer is doing now?! Then try to scare me! What's the name of that cemetery anyways? Bruno's was a great grocery store i agree!!! Anyone remember ParkAir Mall. This was so unique with the ice skating rink in the center. As a child of the 80's I can't seem to remember the mall at it's best. My only memories where walking around the mall as my mother shopped at the Kroger. Much of the mall was dead and not many people skating. Thursday's AJC shed some light on the reason Sprayberry Crossing hasn't been redeveloped-the cemetary. It took several years to get the center developed due to lawsuits about Cobb's refusal to rezone the land around the Mays Family Cemetary and the family refusing to sell the land and relocate the cemetary. As a result, Cobb County changed zoning ordinances to require a 45-foot buffer around cemetaries. Thus, anyone seeking to redevelop the center will have to accomodate the changed laws, making it nearly impossible to redevelop the center. Evidently, developing the corner has led to bad Karma for all the centers at the intersection of Sandy Plains and Piedmont. None of the 3 supermarkets that occupied 3 of the 4 corners of the intersection are still operating as supermarkets. While the demographics have deversified, the area is still affluent and home values are strong in the surrounding area. The developing of the Sandy Plains/Shallowford intersection probably has as much to do with the decline any demographic shift-the first Altanta area Publix opened at Shallowford, along with KMart relocating from Canton Road. Next Harris-Teeter and Target relocated from the old Richway near Canton Road.Since then, HomeDepot is now in the new KMart and the Harris-Teeter became Kroger, leaving the Sprayberry Kroger redundant. In all honesty, Canton Road and the Sandy Plains/Piedmont Rd intersection defies logic, the area is still having development and infill. However, in Atlanta, commercial strips seem to fall in and out of fashion as quickly as hemlines raise and lower and retail seems driven to build all new rather than redevelop existing areas. Canton Road seems to be as much a victim of development around Town Center/Barrett Parkway as any demographic shift. The bowling alley is now closed for good. Hah!! Here is MY memory of that shopping center. In late summer of 1981 as a 16 year old on my first, real car date, I stopped in the parking lot there on the way to taking her home, and experienced my the first real kisses of my life!!! I'm never in that rea anymore, but on the rare occasions that I've been by, I instantly go back to the night. Let's go back to '81 with Bumper's Junction and Mauldin's Pizza. All good times indeed. OMG, I lived there in late '70's and early '80's-,Bumpers Junction arcade, Mauldins Pizza. If only I could build a time machine...Jeff Bumgarner, Jj Daniel Middle School Class of 1983. My most fond memories of Sprayberry Crossing are... Bumpers Junction (the coolest neighborhood arcade) and our local neighbor Travis Tritt playing in the bar located on the SE corner before he made it big. I worked part-time at the Ogletree's from the day they opened in 1976 to around 1983. It was a really cool grocery store. The aisles were carpeted and the checkout registers were the first in the area to use scanners at the checkout. I grew up in this area (Sandy Plains Road) in the 70s and 80s, and I can remember when this location was cow fields. I remember the sparkling, brand new shopping center being developed. It's really sad to see it as a blighted area. We shopped at Ogletree's and Bruno's--it was closer to our house than the Big Star. I remember there was a restaurant on one of the corners in the 80's. I think it was Italian but can't think of the name...any ideas?? Cafe' Corto was the Italian place. Really good veal parm plus cheesecake! That might be it, doesn't ring a bell, but I was a little kid! I remember they sold candy at the register and I would get little Charleston Chew bars! Everything said about Sprayberry Crossing is still true... Craters and all. This is the first I have heard of the 45 foot setback from the Cemetery. The County Commissioners keep talking about removing this eyesore... interesting they would make it more difficult. The unusual in and out of the Center is because of the Cemetery. Looking back the Cedar Front was a bad idea. The other 2 Shopping centers in the area have survived... but the both have Brick Fronts... in addition to better parking lots and a more visible layout. Agree with others that the shopping around Shallowford and Sandy Plains is far nicer and is hurting the entire SP and East Piedmont area. When my kids were growing up... they played Baseball at Sandy Plains Park just north of Shallowford. The area was so dark (mid 80s) and undeveloped, it was difficult to see the park entrance at night, although the fields were lit. 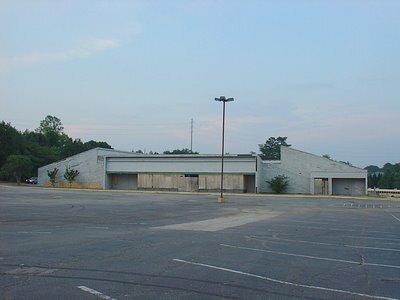 I remember the Kroger that used to be where the LA Fitness is now across from Sprayberry Crossing. Does anyone have any idea to why Kroger closed that store? I didn't realize Sprayberry Crossing had so much history, I've only ever seen it as the run down shopping center it is now. I wish they could do something with it. What was the name of the old bowling alley ? What is the name of the old bowling alley ? Yes, it was Village Lanes. Opened in 1978 closed in 2008. I spent many happy hours there as did many youths and fun loving adults who also loved to bowl. Long term friendships developed there. I lived in Indian Hills during 76-77, worked at Ogeltree's for a few months. Made more in tips than wages carrying out groceries because we carried out every order. Went to Kennesaw Jr. College! Love reading this history. Let's take it back another generation. What was around the area?